Download "For Sale. 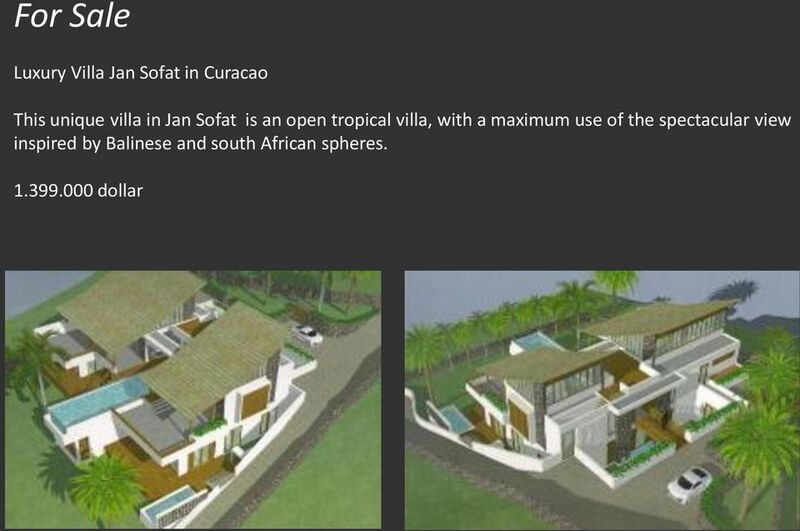 Luxury Villa Jan Sofat in Curacao"
3 Location This distinctive villa is situated in a cul-de-sac, offering tranquility and privacy in the gated urbanization of Jan Sofat, known as one of the most prestigious urbanizations on Curacao. Renown for exquisite villas in the higher segment of the property market, with the magnificent surroundings. 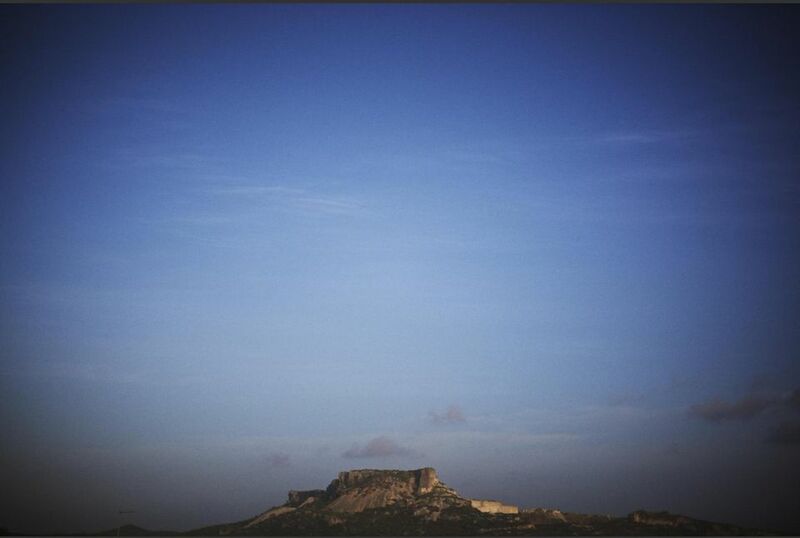 The spot is really unique, as one has a spectacular view of three mountains, the Spanish water and the sea. 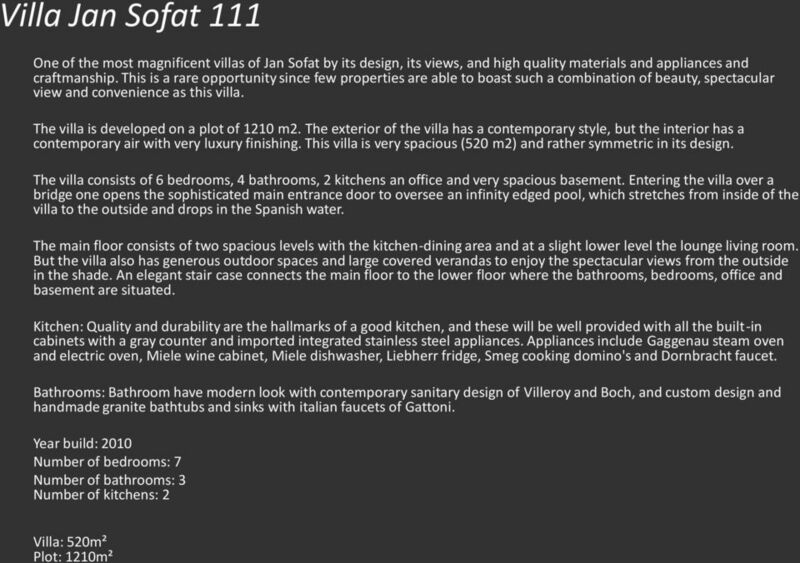 5 The creation of villa Jan Sofat 111 has been the result of a vision to create an environment for those who desire a modern lifestyle in a setting of fine craftsmanship and elegant detail. 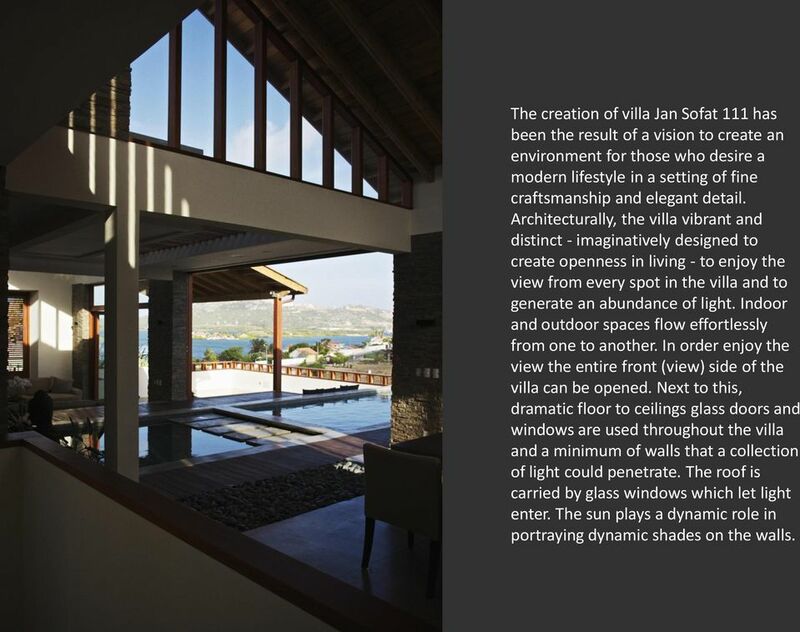 Architecturally, the villa vibrant and distinct - imaginatively designed to create openness in living - to enjoy the view from every spot in the villa and to generate an abundance of light. 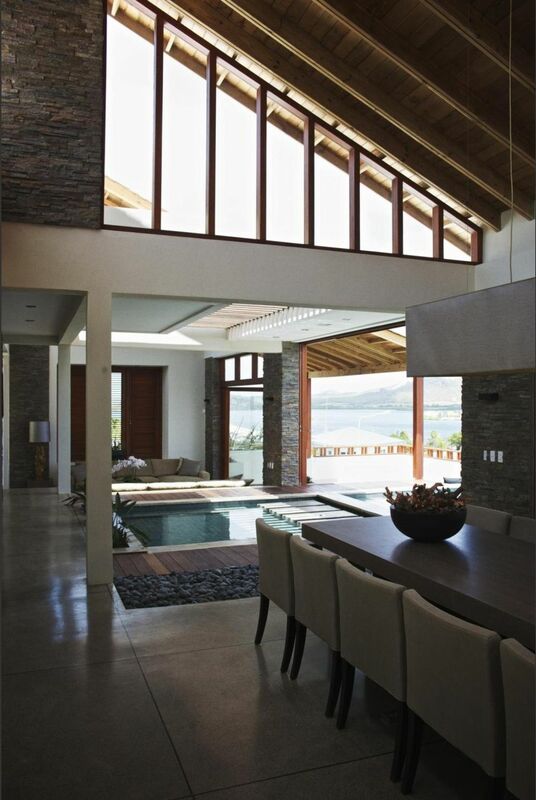 Indoor and outdoor spaces flow effortlessly from one to another. In order enjoy the view the entire front (view) side of the villa can be opened. Next to this, dramatic floor to ceilings glass doors and windows are used throughout the villa and a minimum of walls that a collection of light could penetrate. The roof is carried by glass windows which let light enter. The sun plays a dynamic role in portraying dynamic shades on the walls. 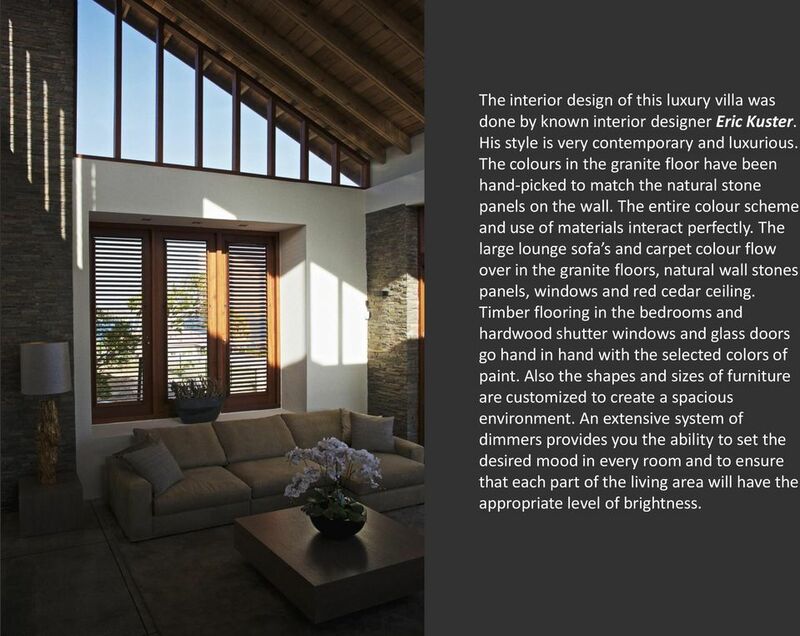 6 The interior design of this luxury villa was done by known interior designer Eric Kuster. His style is very contemporary and luxurious. The colours in the granite floor have been hand-picked to match the natural stone panels on the wall. The entire colour scheme and use of materials interact perfectly. The large lounge sofa s and carpet colour flow over in the granite floors, natural wall stones panels, windows and red cedar ceiling. Timber flooring in the bedrooms and hardwood shutter windows and glass doors go hand in hand with the selected colors of paint. Also the shapes and sizes of furniture are customized to create a spacious environment. An extensive system of dimmers provides you the ability to set the desired mood in every room and to ensure that each part of the living area will have the appropriate level of brightness. 9 The villa is developed on a plot of 1210 m2. 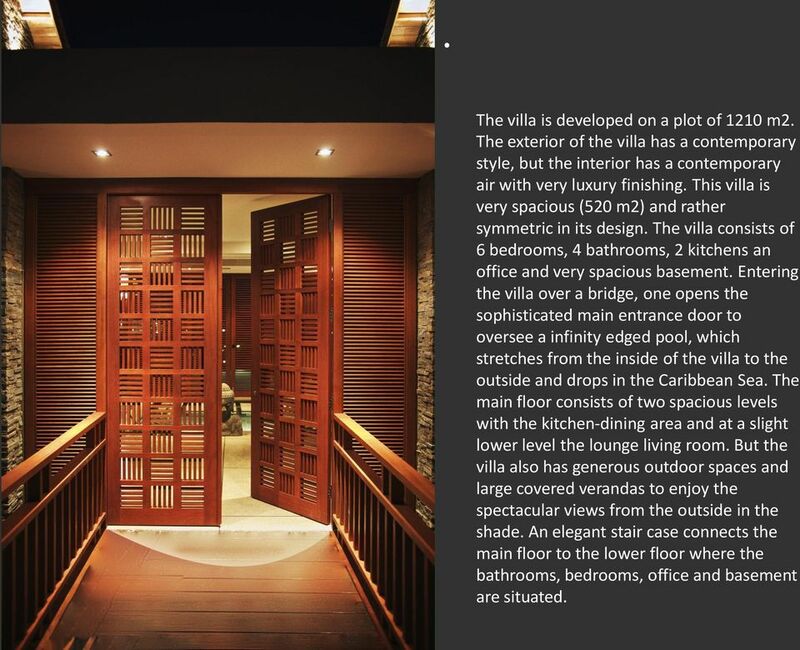 The exterior of the villa has a contemporary style, but the interior has a contemporary air with very luxury finishing. 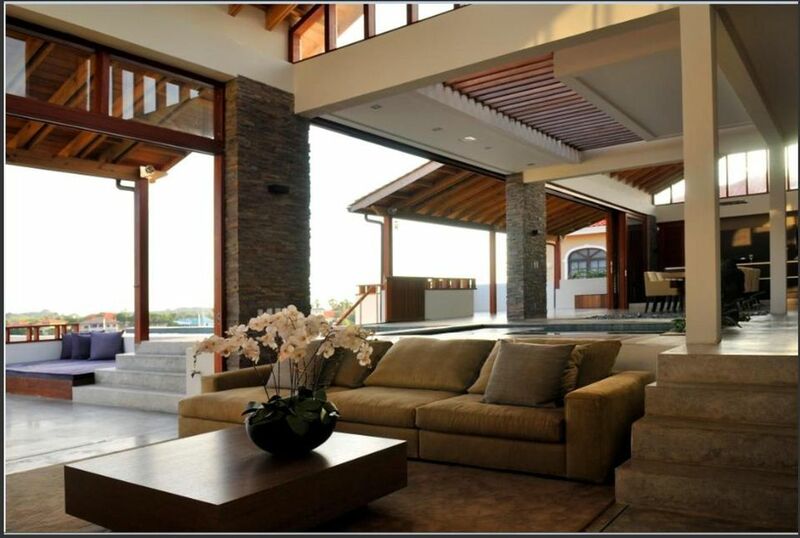 This villa is very spacious (520 m2) and rather symmetric in its design. 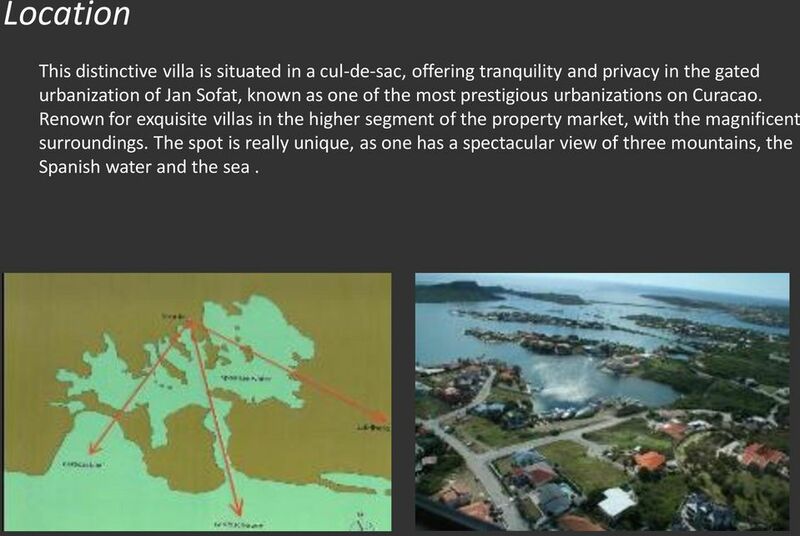 The villa consists of 6 bedrooms, 4 bathrooms, 2 kitchens an office and very spacious basement. Entering the villa over a bridge, one opens the sophisticated main entrance door to oversee a infinity edged pool, which stretches from the inside of the villa to the outside and drops in the Caribbean Sea. The main floor consists of two spacious levels with the kitchen-dining area and at a slight lower level the lounge living room. But the villa also has generous outdoor spaces and large covered verandas to enjoy the spectacular views from the outside in the shade. An elegant stair case connects the main floor to the lower floor where the bathrooms, bedrooms, office and basement are situated. 10 The entire villa is equipped with an integrated alarm system with sensors, beams and window and door connectors. 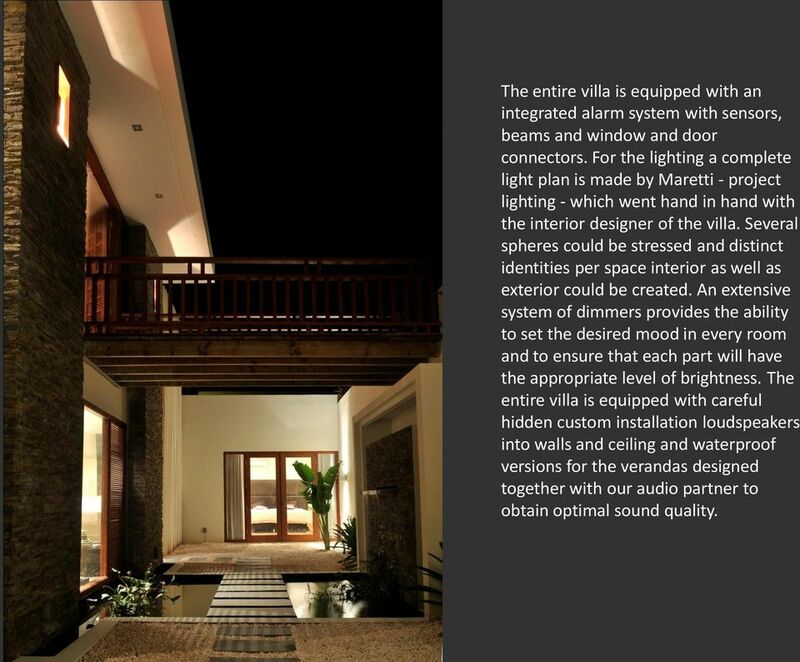 For the lighting a complete light plan is made by Maretti - project lighting - which went hand in hand with the interior designer of the villa. Several spheres could be stressed and distinct identities per space interior as well as exterior could be created. An extensive system of dimmers provides the ability to set the desired mood in every room and to ensure that each part will have the appropriate level of brightness. The entire villa is equipped with careful hidden custom installation loudspeakers into walls and ceiling and waterproof versions for the verandas designed together with our audio partner to obtain optimal sound quality. 11 The villa has been built with high-quality materials, much of which has been imported from around the world, for example, granite floors with sand from Colombia and granite from Venezuela. Natural wall stone panels from China. Slovakian timber flooring in the bedrooms and hardwood shutter windows and glass doors from Indonesia. Red cedar ceilings and shingles from Canada, hand baked green mosaic tiles form Bali. Italian plates and dimmers for electrical devices. American water heating system. English Bowers&Wilkins custom installation loudspeakers. A minimalistic designer kitchen from Germany with professional Gaggenau integrated stainless steel appliances. The bathrooms with stylish granite sinks and baths with Italian faucets. 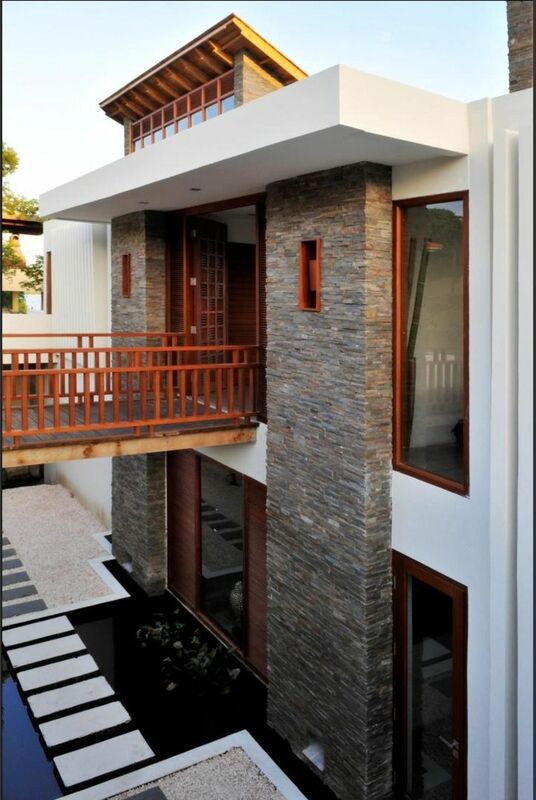 Finally well selected Dutch interior and German exterior paint to create a qualitative and vibrant living environment. The Apartment. A fully integrated home management system provides control of all the electrically operated systems and home entertainment. Home Designer. Interiors. New Version! SAMARA Resort, Marbella SAMARA, LOS ALTOS DE LOS MONTEROS, MARBELLA COSTA DEL SOL, SPAIN HIGHEST QUALITY IN A UNIQUE LOCATION with1, 2 AND 3 BEDROOMS APARTMENTS, 2 BEDROOMS DUPLEX AND 2 & 3 BEDROOM PENTHOUSES. Park View Place. Compass. House. Royal Wharf Gardens Endeavour. House. Thameside. Sienna. House. House. Apartments Townhouses. Challacombe Close Hutton Mount, Brentwood. Challacombe Close Hutton Mount, Brentwood. Challacombe Close Hutton Mount, Brentwood. 1,999,995 Situated within this highly desirable position on Hutton Mount, a detached five bedroom luxury residence. Spring Valley Trails Quick Move In & Inventory Towns Colours have been selected for some of these unit. See Agent for details. Welcome home to Palazzo Condominiums, where everything is gulf front. ew Islington Manchester Apartments for sale or to rent isn t your average building. It s a bit of a one off and is one of the most significant buildings in ew Islington, Manchester s Millennium Community. Lower Level C ethesda, Maryland Crescendo uilders an award winning homebuilder The builder reserves its right to change, upgrade or alter its plans, specifications and materials without notice or obligation. Alltavona Guest House HouseHouse. Alltavona Corran Esplanade, Oban PA34 5AQ. Guide Price 750,000.